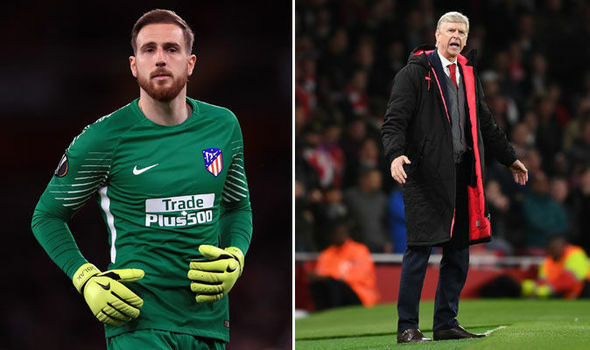 Arsene Wenger says he is leaving the signing of Jan Oblak to ‘other people’ as he prepares to leave Arsenal. Arsenal have been linked with a move for the Atletico Madrid goalkeeper, who shone in a 1-1 Europa League draw on Thursday night. The Slovenian pulled off a string of stunning saves which earned him praise from the Gunners boss. 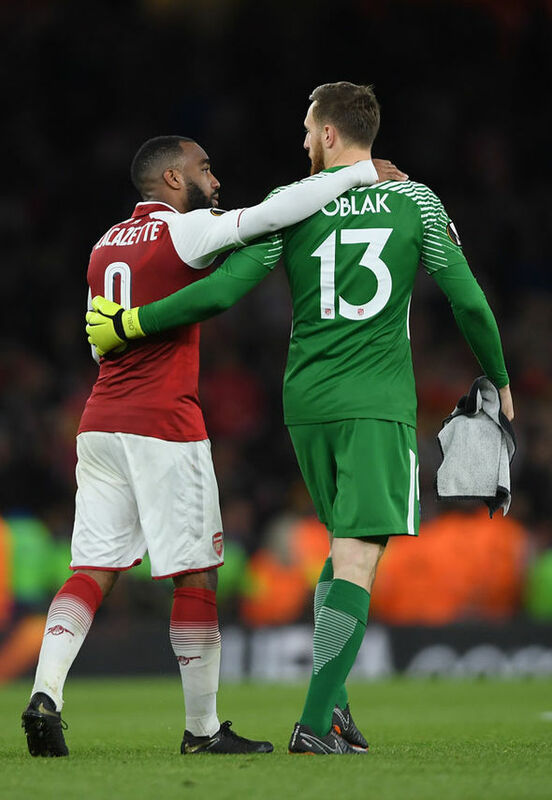 The Gunners dominated the first leg of their last-four clash following Sime Vrsaljko’s 10th-minute red card, Alexandre Lacazette heading in the opener on the hour mark.But, with Wenger dreaming of the perfect end to his Arsenal tenure, a defensive slip allowed Antoine Griezmann to equalise and leave the tie finely poised at 1-1 heading into the return leg in Madrid next week. After announcing he will step down as Arsenal boss at the end of the campaign, this was Wenger’s final European home game at the helm. Yet, after a combination of profligate finishing and a fine performance from Oblak, Wenger was left ruing another game where missed chances could ultimately prove costly. “We produced a performance we wanted to produce, but the result is not in line with the performance,” he said.”We can only look at ourselves on tonight’s result because 1-0 is a perfect result at home. It was down to us after that not to make a mistake. “We had 20 shots on goal, we have seen that against Manchester United (earlier in the season), where we had 33 shots on goal and lost the game. It’s a story we’ve seen before. “For us the task is clear. But of course you come out tonight with a bitter taste, because we had the chances to be in the final tonight. Arsenal manager, Unai Emery, has refused to blame goalkeeper Bernd Leno, for their 3-1 defeat at Wolves on Wednesday night. Ruben Neves scored a stunning free-kick to put the hosts ahead, with Matt Doherty and Diogo Jota also on target before half-time. Leno misjudged Jonny Castro Otto’s cross to allow Doherty to nod home, then he looked to be beaten too easily by Jota, leaving Arsenal with a mountain to climb. Although the Gunners scored a late consolation through Sokratis Papastathopoulos, their Champions League qualification hopes have been dented by back-to-back Premier League defeats. Emery, however, chose not to point the finger of blame at Leno, after Arsenal fell to their heaviest Premier League defeat against a newly promoted team since 1994. “I don’t want to speak about individuals. We need to continue together and not look at one player, defensive or attacking. “In the last two matches we lost good options but the last three matches we are going to play we will play our possibilities,” Emery told a news conference after the game. Arsenal have lost six of their past 10 Premier League games away from home and Emery conceded he was frustrated by his team’s latest poor performance on the road. “I usually am very critical of myself. I am angry with myself when we didn’t do the game plan I wanted. “My idea, my style is to look in front and find the solution, not who is the player who is playing worse or not doing what we spoke of before. “First I think of the solution. That is to think about Sunday and take the possibility to come back with our best performance to take the three points. “When we win, we win together and when we lose, we lose together. In general I think we have possibilities to be in the top four. “We lost the chance to have it in our hands but we will continue and take the opportunity on Sunday,” Emery added. The Gunners’ top-four ambitions took a dent at the Molineux, as they suffered a second successive defeat in the Premier League. Ruben Neves, Matt Doherty and Diogo Jota all scored in the first half, before Sokratis grabbed a consolation goal after the break. “We can be frustrated but the Premier League is about being consistent over 38 matches. “We knew before the match that it was going to be difficult because all season Wolverhampton are feeling strong, defensively they are a good team and offensively they have very fast players. Their organisation was very good and to break this was going to be difficult. “In the first 25 minutes we started very well, controlled the possession but did not have many chances to score,” Emery told BBC Sport. Manchester City defeated Manchester United 2-0 on Wednesday night, to take control of this season’s title race. Bernardo Silva and Leroy Sane scored two second-half goals, to give City all three points at Old Trafford. For United, it was their seventh loss in nine fixtures. City now have 89 points, one more than Liverpool. At the Molineux, Arsenal’s top four hopes suffered a crushing blow, as they were beaten 3-1. The Gunners were three goals down in the first half, thanks to strikes from Ruben Neves, Matt Doherty and Diogo Jota. Sokratis’ header in the second half, was only a consolation for Unai Emery’s men.